The looming "Carmageddon" in Los Angeles made the front page of today's Wall St. Journal, as residents there brace for the two-plus day closure of ten miles of the famed San Diego Freeway (I-405) this weekend. The disruption is apparently required to allow for some demolition necessary for the construction of new high-occupancy vehicle (HOV) lanes on the 405. As locals assess their alternate routes--there are many--they might also want to spend some time thinking about who will be allowed to drive in those new HOV lanes. California recently decided to deny ordinary (non-plug-in) hybrid cars that privilege, in preference to plug-ins and other alternatively fueled vehicles. The new policy and the one it replaces both reflect muddled thinking, but I would argue that abandoning hybrids at this juncture is a mistake, at least if saving gas is still a priority in the Golden State. I routinely commuted on that stretch of the 405 between the Santa Monica Freeway (I-10) and the Ventura Freeway (US-101) when I lived on the West Side and worked in Mid-Wilshire and later in the San Fernando Valley. I carpooled for part of that time but for most of it, like most other Angelenos, I drove alone. I would have found the option of going solo in the HOV lanes a very appealing way to avoid the frequent stop-and-go traffic, and that's why offering that right to hybrid cars has been a useful non-cash incentive to boost their sales. State officials apparently concluded that normal hybrids are now commonplace, so the incentive should be shifted to the even more efficient cars now becoming available. They have emissions data on their side, because California's electricity mix is dominated by hydropower, nuclear and efficient gas turbines, plus a growing contribution of non-hydro renewables, though it also includes some imported coal-fired power from the Four Corners region. A plug-in should indeed emit less CO2 (directly and indirectly) than a Prius-type hybrid under those conditions. What I think the state's regulators have missed, however, is that simpler hybrids, which currently enjoy no other incentives, still look like an equally effective way to save gasoline. That's particularly true if most buyers of plug-in cars are choosing them in preference to non-plug-in hybrids, rather than instead of gas-guzzling conventional cars. 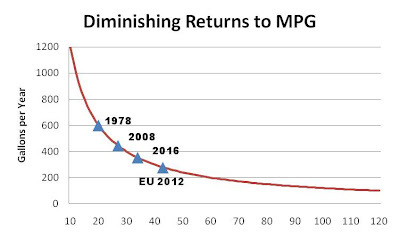 It comes down to the simple, but often counter-intuitive math of fuel economy the way we calculate it in the US, yielding diminishing gallon savings for increasing miles per gallon (see chart below.) Consider a 50 mpg hybrid that replaces a 25 mpg conventional car. Driven 12,000 miles per year, this choice saves 240 gallons per year. Trading in that hybrid for a plug-in like a Nissan Leaf only saves an additional 240 gallons per year, while a Chevy Volt would save somewhat less than that, unless it were never filled up. Moreover, plug-ins didn't lack for incentives already. In addition to the federal tax credit of up to $7,500 per car, California offers its own rebate of up to $5,000 for qualifying plug-ins, which also receive discounted rates for electricity. Then there's the money the state is investing in recharging infrastructure. Whether or not the aggregate level of incentives is justified on grounds of economics, environmental and energy security benefits, throwing the HOV benefit on top of them seems like an unnecessary gilding of the lily. The 85,000 hybrids that were given the sticker allowing HOV access for solo drivers still represent a tiny fraction of the state's 39 million registered motor vehicles, and offering 40,000 new stickers for EVs won't make a noticeable dent in California's emissions, or its 40 million gallon-per-day gasoline consumption. I don't know whether this weekend's Carmageddon will live up to its name, or like L.A.'s 1984 Summer Olympics result in lighter-than-normal traffic because motorists had enough notice to allow them to plan ahead. Yet it does seem that continuing to offer HOV access for non-plug-in hybrids would provide a meaningful incentive for a class of gas-saving vehicles that still represents only around 3% of US car sales, at no cash cost to the state. And if the state is truly concerned that a growing hybrid population could choke the HOV lanes and make them less useful for everyone, an even better option would be to auction the stickers, with only buyers of hybrids, plug-ins and other alternative fuel cars eligible to bid. The proceeds might be sufficient to relieve the state's battered budget of a large portion of the cost of the cash subsidies they're already paying on plug-in cars.